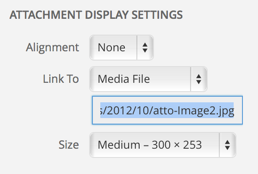 When you upload images to WordPress using Add Media, WordPress automatically links to the image file. What that means is that when you insert the image, there is a link to the original version of the image you just inserted. If the user clicks that image, WordPress replaces the current page with a page displaying the image. Of course, you can easily override this setting each time you insert an image, but there’s is an easy way to change the default setting to no link. WARNING: Do not change any other settings on this screen unless you know what you’re doing. That’s it. Now, when you insert a new image, it will have the default settings you prefer.